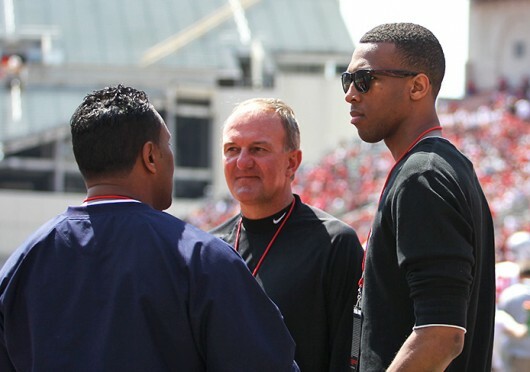 Trevor Thompson (right) talks with OSU men’s basketball coach Thad Matta during the 2014 Spring Game April 12 at Ohio Stadium. Thompson announced his decision to transfer to Ohio State April 13. Seniors Aaron Craft and Lenzelle Smith Jr. might be gone, along with junior LaQuinton Ross and sophomore Amedeo Della Valle, but Ohio State men’s basketball coach Thad Matta is not wasting any time filling those vacancies. After announcing that former-Temple redshirt-junior forward Anthony Lee would transfer to Ohio State last month, Matta has secured another inside presence in Trevor Thompson. Thompson, who spent his freshman season with Virginia Tech, can start playing for the Buckeyes beginning in 2015-16 after sitting out for a season per NCAA transfer rules. Thompson tweeted his excitement in joining the Buckeyes on April 13, a day after attending the 2014 Spring Game at Ohio Stadium. “Well it’s official I’m a Ohio State Buckeye Show Me Love #BuckEyeNation !!!!!!!!!!!!!! !” Thompson tweeted from his personal account, @TrevBallinTrey2, at 1:29 p.m. April 13. During 2013-14, Thompson started 11 times for Virginia Tech, averaging five points and 4.7 rebounds per game. Last season, OSU finished ninth in the Big Ten in rebounding margin, only grabbing 0.3 more boards per game than their opponents, and the Buckeyes are likely to benefit from Thompson’s ability on the glass. With the Buckeyes’ top two centers from last season, juniors Trey McDonald and Amir Williams, entering their final year of eligibility next year, Thompson is set to join David Bell, a member of the 2014 recruiting class, as one of only two centers on the roster. This kid is a great addition to the Buckeyes! !